I shared a few weeks ago that I’m working toward a VBA2C (vaginal birth after 2 cesareans) later this summer. I’ll try just about anything that will help me have an easier delivery! So I was pretty surprised to read that eating dates in my final month of pregnancy might help labor progress more quickly. I read a study published in the Journal of Obstetrics and Gynecology that found date eaters were less likely to need medication to start labor or to keep it progressing. (I’ve always gone into spontaneous labor, but my posterior babies meant I was slow to dilate) Date eaters were also more dilated upon arrival at the hospital and, on average, labored about 7 hours less than non-date eaters. There was also a finding that the women who ate dates had less incident of broken water, which can give a laboring woman more options in a hospital setting. Of course, the study isn’t sure why this is, but suggests there might be a compound in dates that mimics the hormone oxytocin (the hormone that causes contractions). The study had a small sample size (69 women who ate dates and 45 women who did not), but found significant results. The authors suggested they want to do a controlled trial of date eating, but I wasn’t able to find any follow up to see if that actually happened. I’m happy to sign up if it’s going on! I’ll file this under “can’t hurt, might help,” and start searching Pinterest for some good date recipes. Up first: dates stuffed with goat cheese, toasted, with honey on top. 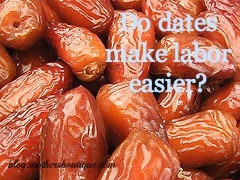 Did you eat a lot of dates during late pregnancy? Leave us a comment to share how/if this affected the length of your labor.